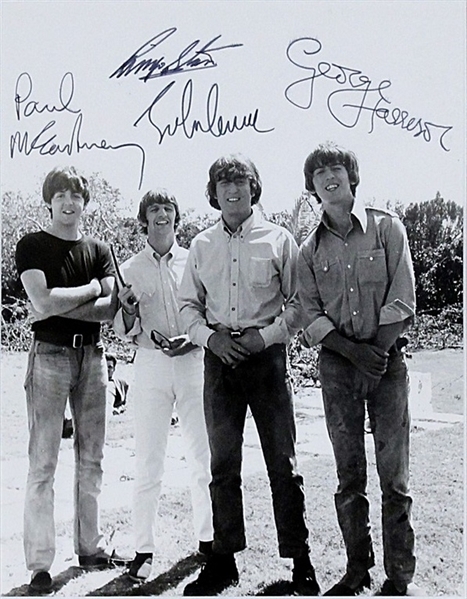 The Beatles Paul McCartney, John Lennon, George Harrison and Ringo Starr have beautifully signed this black and white original photograph taken in 1964 in the Bahamas while they were shooting "Help!" Signed in black felt tip marker. The photograph is mounted on foam core board and measures 8 x 10. Very good condition, with some very light surface creases. Comes with a Gotta Have Rock & Roll™ Certificate of Authenticity. Authenticated by Beatles handwriting expert Frank Caiazzo, if the high bidder wishes to receive a letter of authenticity from Mr. Caiazzo we will assist in this process. Auction closed on Saturday, April 20, 2019.